Selling a company that is indebted to the budget to a destitute person should not be possible. At least this is what the spokesman of the Bulgarian National Revenue Agency (NRA) Rossen Bachvarov said after the scandal with the billions in uncollected VAT broke out. He was firm that a record of lack of obligations to the NRA was required for listing transactions. Some people are obviously more equal than others when it comes to the NRA and the Registry Agency because the above had not been binding for the lawmaker from the ruling Citizens for European Development of Bulgaria party (GERB) Dimitar Gamishev. 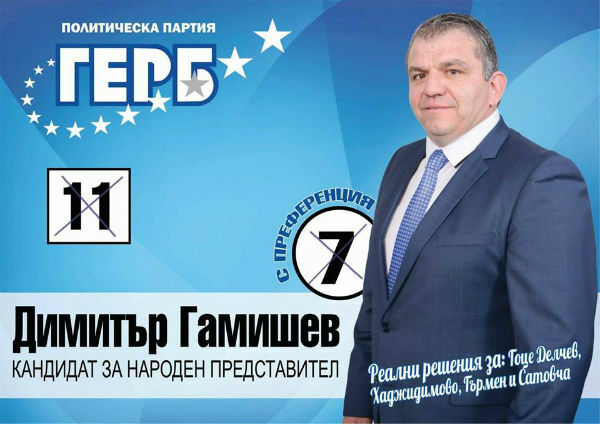 Shortly before being elected for GERB municipal coordinator in the southwestern town of Gotse Delchev at the end of April 2016, Gamishev has gotten rid of his company “Gamishev – NKB” by transferring it to “Finest Associates”. Currently, “Gamishev – NKB” is included in the list of large NRA debtors that do not have property on which levy measures may be imposed. The company owes BGN 195,774 to the Treasury. It had been added to the NRA’s blacklist in August 2017, but the large debts had existed long before that, while Dimitar Gamishev had been its sole owner, according to the company’s annual financial reports. How, then, was the sale of the company entered by the Registry Agency is a mystery, but it is also a fact. “Finest Associates” is a company with a capital of BGN 2 and it is registered in the northwestern city of Lovech, on 5A Shipka Street. Its owner and manager is Georgi Mihaylov Georgiev. The same person manages 93 companies and owns another 53, according to the Trade Register. A total of 23 companies are registered at the address of “Finest Associates” in Lovech on 5A Shipka Street. An investigation by Bivol showed that at least ten of Georgi Georgiev’s companies owe amounts of tens and hundreds of thousands of levs to the NRA. All this is striking proof that Gamishev has sold his firm to a professional strawman being fully aware that he was doing so to avoid paying taxes. Now, the NRA can only quietly write off the overdue tax. Due to the write-offs of such uncollectible tax bills, in the last few years the Treasury had become by BGN 5 billion poorer and this pertains just to uncollected VAT. This was revealed by the data released last week by the Civil Movement “BOEZ” (Fighter). Dimitar Gamishev is not a man who is financially strapped to the point that he cannot pay his taxes. Prior to becoming head of the local GERB structure and MP, he was a building contractor and member of “GERB – Entrepreneurs”. At that time, his family’s business flourished. The same “Gamishev-NKB”, according to Daxi records, reported an impressive net sales revenue of BGN 1.7 million in 2013, BGN 1.2 million in 2014 and BGN 3.5 million in 2015. In 2012, Gamishev’s wife, Boyanka, has received nearly EUR 400,000 in European funding from the Rural Development program (RDP) for a guest house in the village of Gaytaninovo. His sister-in-law, Angelina Gamisheva, has taken from the same program nearly BGN 300,000 for guest houses in the village of Leshten. There is a slim chance that the Prosecutor’s Office will show interest and press charges against the clever MP for tax evasion on a particularly large scale. It will be facilitated in this endeavor by the fact that the GERB MP has already been stripped of immunity. In mid-2107, Prosecutor General Sotir Tsatsarov demanded this immunity after Gamishev was accused of murdering a pedestrian while speeding. So far, however, there is no evidence that the collection rate of taxes written off because of such frauds has increased due to the actions of the public prosecutor, even on the contrary. According to whistleblower and rebel investigator Boyko Atanassov, cases of large-scale VAT and other tax evasion usually end up “simmering” in somebody’s desk. This is the rule if the cases are against an “unknown perpetrator” who is otherwise known to all as an individual close to the government, but not to Tsatsarov’s office.